This DTC can only occur if there is a problem inside the ECM. The ECM is not repairable. Loss of signals from the main and backup crankshaft speed / position sensors. The ECM detects that the signal inputs of the crankshaft position and camshaft position sensors are connected in reverse order. The engine speed signal from the camshaft position sensor is not detected. Possible causes for this DTC are damage to the camshaft position sensor, an open or short circuit in the circuit, or a fault in the power circuit. The engine speed signal from the crankshaft position sensor is not detected. Possible causes for this DTC are damage to the crankshaft position sensor, an open circuit or short circuit in the circuit or a malfunction in the power circuit. The intake manifold pressure sensor circuit is above normal or short circuit. The ECM determines that the voltage signal of the pressure sensor in the intake manifold exceeds the value specified in the calibration for more than 1 second. The intake manifold pressure sensor circuit is undervoltage or short circuit. The ECM determines that the voltage signal of the pressure sensor in the intake manifold is less than the value specified in the calibration for more than 1 second. Intake manifold pressure sensor circuit – the data is accurate, but exceeds the norm. This DTC becomes active when the pressure in the intake manifold exceeds the maximum allowable value for a given engine power rating. The pressure in the intake manifold exceeded the maximum allowable value for a given engine rated power. A high voltage is detected in the pedal or accelerator lever position sensor circuit. The ECM determines that the accelerator pedal position sensor signal voltage exceeds the value specified in the calibration for more than 1 second. A low voltage is detected on the pedal or accelerator lever position sensor circuit. The ECM detects that the accelerator pedal signal voltage is out of range (below normal). A high voltage is detected in the signal circuit of the pedal position sensor or the remote control accelerator lever. The ECM detects that the signal voltage of the remote control accelerator pedal is out of range (above normal). The ECM detects that the signal voltage of the remote control accelerator pedal is out of range (below normal). A high signal voltage is detected in the oil pressure sensor circuit. The ECM determines that the oil pressure sensor signal voltage is greater than 4.75 V DC for more than 16 seconds. A low signal voltage or an open circuit is detected in the oil pressure sensor circuit. The ECM determines that the oil pressure sensor signal voltage is less than 0.25 VDC for more than 16 seconds. A high signal voltage or an open circuit is detected in the coolant temperature sensor circuit. The ECM detects that the coolant temperature sensor signal voltage is greater than 5.13 VDC for more than 1 second. A low signal voltage is detected in the coolant temperature sensor circuit. The ECM detects that the engine coolant temperature signal voltage is out of range (below normal). Coolant temperature is above the warning limit of the engine protection system. The ECM determines that the coolant temperature exceeds the limit specified in the calibration. A coolant temperature sensor signal indicates that it is above the critical limit of the engine protection system. The ECM determines that the coolant temperature exceeds the engine protection limit. A high signal voltage is detected in the intake manifold temperature sensor circuit. The ECM determines that the voltage signal of the temperature sensor in the intake manifold exceeds the value specified in the calibration for more than 1 second. A low signal voltage is detected in the intake manifold temperature sensor circuit. The ECM detects that the voltage signal of the temperature in the intake manifold is out of range (below normal). An intake manifold temperature sensor signal indicates that it is above the critical limit of the engine protection system. The ECM detects that the air temperature in the intake manifold exceeds 132 ° C for 5 seconds. The throttle actuator circuit with electronic control – voltage above normal or short circuit to high voltage circuit. The ECM detects a short circuit to the power circuit or an open circuit in the power supply circuit of the throttle motor at the inlet. The throttle actuator circuit with electronic control – voltage below normal or short circuit to low voltage circuit. The ECM detects a short to ground in the throttle actuator motor inlet power circuit. Electronically controlled throttle actuator – the reaction of the mechanical system is not correct or the adjustment is broken. The ECM detects that the response of the mechanical system throttle with electronic control does not conform to the norm. Sensor Power Circuit – Voltage below normal or short to low voltage circuit. The ECM determines that the voltage in the sensor power supply is less than the value specified in the calibration for more than 1 second. A / C clutch signal in the on state indicates a short to ground. The ECM determines that the signal from the air conditioning clutch indicates a short circuit. A high signal voltage is detected in the coolant level sensor circuit. The ECM detects that the coolant level signal voltage is out of range (above normal). A low signal voltage is detected in the coolant level sensor circuit. The ECM detects that the coolant level signal voltage is out of range (below normal). The ECM determines that the coolant level is below normal. The engine oil temperature sensor circuit is above normal or shorted to high voltage. The ECM detects that the oil temperature sensor signal voltage is greater than the value specified in the calibration for more than 1 second. The engine oil temperature sensor circuit is undervoltage or shorted to a low voltage circuit. The ECM detects that the oil temperature sensor signal voltage is lower than the value specified in the calibration for more than 1 second. Engine oil temperature is accurate, but above normal is the highest level of severity. The ECM detects that the oil temperature exceeds 122 ° C for 5 seconds. A high signal voltage has been detected in the atmospheric pressure sensor circuit. The ECM detects that the voltage signal of the atmospheric pressure is out of range (above normal). A low signal voltage has been detected in the atmospheric pressure sensor circuit. The ECM detects that the voltage signal of the atmospheric pressure is out of range (below normal). Sensor Power Circuit – Voltage above normal or short to high voltage circuit. The ECM determines that the voltage in the sensor power supply exceeds the value specified in the calibration for more than 1 second. The engine speed signal indicates that this parameter exceeds the activation limit of the engine protection system. The ECM detects that the engine speed exceeds the limit specified in the calibration. A low voltage is detected in the power supply circuit of the engine speed sensor +5 V.
The ECM detects that the sensor supply voltage is out of range (below normal). A high voltage is detected in the power supply circuit of the 5-volt engine speed sensor. The ECM detects that the sensor supply voltage is out of range (above normal). The ECM does not receive a vehicle speed signal, or this signal changes randomly. The ECM detects a loss of vehicle speed signal when other engine conditions indicate that the vehicle is in motion. The ECM detects that the coolant level sensor signal voltage is greater than 5.124 VDC for more than 20 seconds. Fan control circuit – voltage below normal or short circuit to low voltage circuit. A low signal voltage is detected in the fan control circuit when a start command is issued. The ECM detects that the PWM signal of the fan control is not equal to the system’s power supply when this signal is set to turn on. A high signal voltage is detected in the ambient temperature sensor circuit. The ECM detects that the signal voltage of the ambient temperature is out of range (above normal). Engine oil level – chaotic nature or incorrect data. The ECM detects a random signal from the oil level sensor. The ECM receives a signal from the oil level sensor – a very low oil level is detected. The fuel shut-off valve circuit – voltage below normal or short circuit to low voltage circuit. The ECM detects that a low voltage has been detected in the fuel shut-off valve circuit. Fuel shut-off valve circuit – voltage is above normal or short circuit to high voltage circuit. The ECM detects an open or short to power source in the fuel shut-off valve circuit. Ambient Temperature Sensor Circuit 1 – Voltage below normal or short to low voltage circuit. The ECM detects that the signal voltage of the ambient temperature sensor is less than 0.12 VDC for more than 1 second. A low voltage has been detected in the ambient temperature sensor circuit. The ECM detects that the signal voltage of the ambient temperature is out of range (below normal). Fuel shut-off valve – the reaction of the mechanical system is not correct, or the adjustment is broken. The ECM limits that a mechanical shut-off of the fuel shut-off valve in the open position has occurred, or there is a leak. Anti-theft system password check passing indicator – chaotic character or incorrect data. Attempt to start the engine without permission of the anti-theft system. This DTC becomes active if the anti-theft system has not been disabled. A low signal voltage is detected in the circuit of the fuel system actuator valve. A pulse width modulated signal with a level equal to the system supply voltage when this signal is turned on is not detected in the fuel system actuator valve circuit. A high signal voltage or an open circuit is detected in the circuit of the fuel system actuator valve. The ECM detects the presence of a short circuit on the supply circuit, a short circuit between the contacts or an open circuit in the actuator valve of the fuel pump. This DTC goes into an active state when a discharge pressure mismatch between two high-pressure plungers is detected in the fuel pump. The ECM does not receive messages from a device connected to the multiplex network in a timely manner or does not receive it at all. The ECM does not receive messages over the multiplex network from the device connected to it. The ECM detects an open circuit or short circuit in the J1939 communications wire harness. The ECM received only a fraction of the information it expected from the network device. The ECM receives an invalid J1939 communication channel message from the multiplex device for more than 1 second. Vehicle Electronic Control Module (VECU), included in the complete equipment, has detected an accelerator fault. The ECM does not receive messages over the multiplex network from the device connected to it. Vehicle Electronic Control Module (VECU) has detected a malfunction of the remote control accelerator. The J1939 ECM received a message from the VECU unit (complete equipment) indicating that the remote control accelerator signal circuit or remote control switch has a short to high or low voltage circuit. Failure of the protected communication channel (communication channel with the complete equipment / vehicle) – the rate of data update does not correspond to the norm. Anti-theft system will not work normally. The engine may not start. The ECM cannot communicate with the anti-theft system via J1939 communication channel. Auxiliary temperature sensor input – special instructions. Verify the calibration of the electronic control module (ECM). A high signal voltage or an open circuit is detected in the auxiliary temperature sensor circuit of the complete equipment. A low signal voltage is detected in the auxiliary temperature sensor circuit of the complete equipment. Atmospheric pressure – the chaotic nature or irregularity of the data. The chaotic nature of the signal of the ambient air pressure sensor during the first turn of the start switch to the ON position. A high signal voltage has been detected in the pressure sensor circuit of the complete equipment. A low signal voltage or an open circuit is detected in the auxiliary pressure sensor circuit of the complete equipment. The relay circuit of the solenoid valve of the injector of the cylinder 1 – the current is above normal or short to ground. The current detected on the nozzle 1 when the voltage is off. The ECM determines that there is a short to the supply circuit, a short to battery plus, or a low injector electromagnet resistance in the injector circuit. The circuit of the relay of the electromagnetic valve of the injector of the cylinder 5 is a current above the norm or a short to ground. The current detected on the nozzle 5 when the voltage is off. The relay circuit of the cylinder 3 solenoid valve is a current above normal or a short to ground. The current detected on the nozzle 3 when the voltage is off. The relay circuit of the solenoid 6 solenoid valve is a current above normal or short to ground. The current detected on the nozzle 6 when the voltage is off. The circuit of the relay of the electromagnetic valve of the injector of the cylinder 2 is a current above the norm or short to ground. The current detected on the nozzle 2 when the voltage is off. Interrupting the power of a real-time clock is a chaotic character or incorrect data. Loss of power to the real time clock. The ECM detects that real-time clock data has been lost due to a power failure. The relay circuit of the solenoid valve of the solenoid valve of the cylinder 4 is a current above normal or short to ground. The current detected on the nozzle 4 when the voltage is off. Nozzle 1 detects a current when the voltage is off. The ECM has detected an internal failure in the injector circuit (s). If the current turns out to be higher than normal, the ECM will stop the injection through the faulty injector (s). Nozzle 3 detects a current when the voltage is off. Nozzle 2 detects a current when the voltage is off. Nozzle 4 detects a current when the voltage is off. In the nozzle 5 is detected current when the voltage is off. In the injector 6, the current is detected when the voltage is turned off. The coolant temperature signal does not change depending on the engine conditions. The ECM detects that the engine coolant temperature signal voltage is out of range. The circuit of the auxiliary relay for switching off the engine during continuous operation at idle is a voltage higher than normal or a short circuit to the high voltage circuit. The ECM detects an open or short circuit in the auxiliary engine shut-off circuit for extended idling / ignition operation. The circuit of the auxiliary relay for switching off the engine during continuous operation at idle is a voltage below normal or short circuit to a low voltage circuit. A low voltage is detected in the auxiliary engine shut-off relay circuit during long-time idling / ignition when the switch-on signal is applied to the relay. ECM Internal Failure Warning – Logic Device Failure. An ECM power supply fault has been detected. This DTC is recorded when the ECM internal diagnostic routine detects an internal write or read error in the module. The ECM calibration software is a fault in the logic device. The ECM detects an invalid configuration of the contact sensor configuration, which is set using configurable parameters. Injector power supply circuit – Malfunction of a logic device. The injector turn-on voltage measured by the ECM is low. The ECM determines that the voltage in the power supply circuit of the injectors is less than the specified value. The intake air flow sensor circuit is a voltage above normal or short circuit to a high voltage circuit. The ECM determines that the mass air flow sensor signal exceeds the allowable maximum limit. The intake air flow sensor circuit is undervoltage or short circuit to a low voltage circuit. The ECM determines that the mass air flow sensor signal is less than the minimum allowed limit. The intake air flow sensor circuit is a chaotic character or incorrect data. The air flow sensor signal does not match the engine operating conditions. A high voltage has been detected in the sensor 1 power supply circuit. The ECM determines that the voltage in the sensor supply circuit is higher than normal. Oil pressure signal indicates that it is below the critical limit of the engine protection system. The ECM determines that the oil pressure sensor signal voltage is less than the minimum operating limit. The signal of water in the fuel – the data is accurate, but above the norm – the lowest level of severity. Water in the fuel filter detected. The ECM determines that the water level in the fuel filter is above the level of the sensor. The ECM determines that the engine oil temperature sensor reads above or below the other sensors installed on the engine after a long engine shutdown. Loss of communication between the ECM and another device over SAE J1939. The ECM detects an open circuit or short circuit in the J1939 communications wiring harness. The sensor circuit of the presence of water in the fuel – Voltage above normal or short circuit on the high voltage circuit. The ECM determines that the voltage in the sensor signal circuit exceeds 4.95 VDC for 1 second. The sensor circuit of the presence of water in the fuel – Voltage below normal or short circuit on the low voltage circuit. The ECM determines that the voltage in the sensor signal circuit is less than 0.05 V dc for 1 second. The idling check sensor circuit is a chaotic character or incorrect data. The ECM detects the simultaneous appearance of a voltage signal at the contacts of the presence and absence of idling of the sensor checking the idling. Voltage should only appear in one of the circuits. The circuit for checking the position of the idle stroke of the pedal or accelerator lever is a violation of calibration. The ECM determines that the accelerator pedal position sensor and the idle speed sensor signal do not match. The ECM detects that the oil pressure is higher or lower than other absolute pressure sensors. The intake manifold temperature sensor circuit is a chaotic character or incorrect data. The ECM determines that the temperature sensor in the intake manifold reads above or below the other sensors installed on the engine after a long engine shutdown. The battery voltage is accurate, but below normal. The ECM supply voltage is below the minimum level. The ECM determines that the main battery voltage is less than 6 V DC. The battery voltage is accurate, but above normal. The ECM supply voltage is above maximum level. The ECM determines that the main battery voltage is greater than 36 V DC. The circuit of the pressure sensor in the common high pressure fuel line is accurate, but exceeds the norm. The ECM detects that the pressure in the common high pressure fuel line is higher than the pressure of the fuel pressure reducing valve. A high signal voltage was detected in the pressure sensor circuit in the common high pressure fuel line. The ECM detects that the fuel supply pressure sensor signal voltage is less than 0.20 VDC for more than 1 second. A low signal voltage is detected in the pressure sensor circuit in the common high pressure fuel line. The ECM detects that the fuel pressure sensor signal voltage is greater than 4.80 VDC for more than 1 second. Turbocharger bypass valve control circuit – voltage is above normal or short circuit to high voltage circuit. The ECM determines that a high voltage has been detected in the turbocharger bypass control circuit. Turbocharger bypass valve control circuit – voltage is below normal or short circuit to low voltage circuit. The ECM determines that a low voltage is detected in the turbocharger bypass control circuit. Oil level sensor detected low oil level. The voltage applied to the fluid injection controller for diesel engine exhaust systems is lower than the voltage in the electrical system. The fluid injection controller for diesel exhaust systems detects that the battery voltage is below the threshold. The voltage applied to the fluid injection controller for exhaust systems of diesel engines exceeds the voltage in the electrical system. The fluid injection controller for diesel exhaust systems detects that the battery voltage exceeds a threshold value. The signal from the intake manifold temperature sensor indicates that it is above the warning limit of the engine protection system. The circuit of the oil level sensor is voltage is above normal or short circuit to high voltage circuit. The ECM detects a short circuit in the signal circuit to battery positive or an open ground circuit. The circuit of the oil level sensor is undervoltage or short circuit to the low voltage circuit. The ECM detects an internal failure in the oil level sensor. The additional torque curve selection switch is a chaotic character or incorrect data. The ECM detects an open circuit in the torque curve selection switch circuit. Auxiliary input / output – voltage above normal or short circuit to high voltage circuit. The ECM determines that a high signal voltage has been detected in the auxiliary I / O circuit. Turbocharger Bypass Valve Control Circuit — Mechanical System Response Not Correct or Adjusted. The ECM determines that the pressure in the intake manifold has exceeded the maximum allowable value for a given engine power rating. The ECM detects that the fuel pressure is higher than specified. The circuit of the pressure sensor in the common high-pressure fuel line is a chaotic character or incorrect data. The ECM detects no change in the fuel pressure sensor signal. The ECM detects that the crankcase pressure is above a predetermined level. Crankcase pressure is data accurate, but above normal is the highest level of severity. The pressure sensor circuit in the common high pressure fuel line is accurate, but below normal, the average severity level. The ECM detects that the fuel pressure is below the set pressure. Starter Relay Control Circuit – Voltage above normal or short to high voltage circuit. An open circuit or high voltage is detected in the starter lock circuit. Starter Relay Control Circuit – Voltage below normal or short to low voltage circuit. A low voltage is detected in the starter lock circuit. The battery voltage monitoring feature has detected that it is high. The ECM determines that the battery voltage is higher than the one specified in the calibration. The battery voltage monitoring feature has detected that it is low. The ECM determines that the battery voltage is less than the one specified in the calibration. The battery voltage monitoring feature has found that it is very low. The magnitude of the dual output signals exceeded the activation limit of the engine protection system. The ECM determined that the magnitude of the dual output signals exceeded the activation limit of the engine protection system. The ECM has determined that, in accordance with the programmable parameter of the maintenance control function, the engine oil and filter must be replaced. Turbocharger speed – the chaotic nature or irregularity of the data. The ECM detected an invalid turbocharger speed signal. Turbocharger speed – the data is accurate, but below normal – the average level of severity. The ECM has detected a low turbocharger speed. The engine oil level is accurate, but above normal. The oil level sensor has detected a high oil level. The rotational speed / position of the engine crankshaft is the chaotic nature or irregularity of the data. The ECM has detected a crankshaft position sensor signal error. A high signal voltage was detected in the temperature sensor circuit at the input of the turbocharger compressor. The ECM detects that the temperature signal at the input of the turbocharger compressor is greater than 4.8 VDC for more than 1 second. A low signal voltage is detected in the temperature sensor circuit at the input to the turbocharger compressor. The ECM detects that the temperature signal at the input of the turbocharger compressor is less than 0.2 VDC for more than 1 second. The temperature at the inlet to the turbocharger compressor is chaotic or irregular. The ECM detects that the temperature at the input to the turbocharger compressor is too high or too low for these engine conditions. The ECM internal temperature sensor circuit is above normal or shorted to high voltage. The ECM has detected a short circuit on the internal temperature sensor on the power circuit. A low signal voltage or open circuit is detected in the ECM temperature sensor circuit. The ECM has detected that the internal temperature sensor has a short to ground. An erroneous or invalid temperature inside the ECM was detected. The ECM detects that the signal from the ECM internal temperature sensor has an invalid value. The signals from the engine speed sensor and the camshaft position sensor are not consistent. The ECM determines that the crankshaft position does not match the camshaft position sensor signal input to the ECM. The ECM detects an error in the camshaft position sensor signal. The ECM has detected that the camshaft speed / camshaft sensor signal has disappeared for more than 1 second. The magnitude of the signal from the auxiliary equipment of the complete equipment exceeded the activation limit of the engine protection system. Loss of communication with the adaptive cruise control system. The ECM does not receive a valid message on the J1939 multiplex network from the adaptive cruise control module for more than 1 second. Loss of power when the start switch is set to ON. – chaotic character or incorrectness of data. The voltage in the module power supply circuit briefly falls below the limit specified in the calibration, or the power to the ECM is disconnected incorrectly. The position of the exhaust gas recirculation valve is the chaotic nature or irregularity of the data. The ECM determines that the exhaust gas recirculation valve position sensor generates a chaotic signal, or the position of the exhaust gas recirculation valve does not change as the engine conditions change. The ECM determines that the accelerator pedal position sensor signal voltage is greater than the value specified in the calibration for more than 1 second. A low voltage is detected in the pedal or accelerator lever position sensor 2 circuit. The ECM determines that the accelerator pedal position sensor signal voltage is less than the value specified in the calibration for more than 1 second. Pedal or accelerator position sensors – Chaotic nature or incorrect data. The ECM has determined that the readings of the accelerator position sensor 1 differ from those of the accelerator position sensor by more than 2%. The temperature sensors at the inlet of the catalytic converter and at the exit of it are interchanged in places – the state is preserved. The engine control module (ECM) determines that the inlet temperature of the catalytic converter of the exhaust gas purification system exceeds the inlet temperature of the particulate filter during active regeneration of the particulate filter. There is no catalytic converter in the exhaust system. The electronic control module (ECM) determines that the inlet temperature of the catalytic converter and the inlet temperature of the particulate filter are the same during active regeneration of the exhaust gas cleaning system. A low signal voltage was detected in the temperature sensor circuit at the input of the catalytic converter. The ECM determines that the voltage at the input of the catalytic converter is at less than 0.1 V DC for more than 2 seconds. A high signal voltage was detected in the temperature sensor circuit at the input of the catalytic converter. The ECM detects that the voltage at the input of the catalytic converter is at a voltage greater than 4.97 V DC for more than 2 seconds. The signal of the temperature sensor at the input of the catalytic converter does not change when the engine operating conditions change. The ECM determines that the temperature sensor input signal of the catalytic converter does not change with changing engine operating conditions. A low signal voltage is detected in the level sensor circuit. The ECM detects that the voltage signal of the liquid level in the fluid tank to clean the exhaust gas is out of range (below normal). A high signal voltage is detected in the circuit of the liquid level sensor in the tank of the exhaust gas cleaning system of diesel engines. The ECM detects that the voltage signal of the liquid level in the fluid tank for exhaust gas cleaning is outside the allowable range (above normal). The fluid level for cleaning the exhaust gas in the tank is very low. A low fluid level is detected in the exhaust gas cleaning system tank. The fluid level for cleaning the exhaust gases in the tank has dropped to a critical level. Critically low level liquid for cleaning exhaust gases in the tank. A low signal voltage has been detected in the temperature sensor circuit at the inlet of the particulate filter of the exhaust gas cleaning system. The ECM detects that the signal from the temperature sensor input signal to the particulate filter is less than 0.1 V DC for more than 2 seconds. A high signal voltage was detected in the temperature sensor circuit at the input of the particulate filter of the exhaust gas cleaning system. The ECM determines that the signal from the temperature sensor input signal to the particulate filter exceeds 4.97 V dc for more than 2 seconds. The signal of the temperature sensor at the inlet of the particulate filter does not change with changing engine operating conditions. The ECM determines that the signal from the sensor temperature at the input of the particulate filter does not change as the engine conditions change. The sensor circuit of the temperature of the liquid in the tank exhaust gas treatment system – the voltage is below normal or short circuit on the low voltage circuit. The ECM detects that the signal voltage of the temperature in the fluid tank to clean the exhaust gas is outside the acceptable range (below normal). The sensor circuit of the temperature of the liquid in the tank of the exhaust gas cleaning system of diesel engines – the voltage is above normal or short circuit to the high voltage circuit. The dosing unit for exhaust gas cleaning does not provide the filling system. The exhaust gas dosing unit does not ensure successful filling of the system after several attempts. A high signal voltage is detected in the fluid heater circuit in the exhaust gas cleaning system tank. The ECM detects a short circuit to battery plus or an open circuit in the exhaust gas tank heater circuit. A low signal voltage is detected in the circuit of the fluid heater in the tank of the exhaust gas purification system of diesel engines. The ECM detects a low signal voltage or a short to ground in the heater fluid heater circuit. The fluid injection controller for an exhaust gas cleaning system is a fault in the logic device. An internal error has been detected in the fluid injection controller for the exhaust gas cleaning system. Error data is transmitted to the ECM over the communication channel. Interrupting the power of a real-time clock is a chaotic character or incorrect data. The temperature increase on the catalytic converter of the exhaust gas cleaning system is less than expected. By design, the ECM determined that the efficiency of the catalytic converter is lower than that required to successfully complete the regeneration. A discrepancy was detected in the signal rate of the nitrogen oxide content sensor. The ECM determines that the signal from the nitrogen oxides sensor does not change as the engine conditions change. A high voltage has been detected in the sensor power supply circuit of the complete equipment wiring harness. A low voltage has been detected in the sensor power supply circuit of the complete equipment wiring harness. Air supply valve – voltage is above normal or short circuit to high voltage circuit. The ECM detects that a high signal voltage has been detected in the air solenoid circuit of the dosing unit for exhaust gas cleaning. Air supply valve – voltage below normal or short circuit to low voltage circuit. The ECM detects that a low signal voltage has been detected in the air solenoid circuit of the dosing unit for exhaust gas cleaning. Liquid dosing unit for exhaust gas cleaning system – the rate of updating data is not correct. Communication between the ECM and the liquid dispensing unit for the exhaust gas cleaning system has been interrupted. An exhaust gas heater cannot melt a frozen fluid. The ECM detects that the exhaust gas cleaning fluid heater cannot melt frozen fluid. The fluid heater in the exhaust gas cleaning system tank is accurate, but above normal, the average severity level. Heater fluid for cleaning the exhaust gas in the tank is constantly on. A high signal voltage is detected in the circuit of the crankcase pressure sensor. The ECM determines that the voltage signal from the crankcase pressure sensor is greater than 4.8 VDC for more than 1 second. A low signal voltage is detected in the circuit of the crankcase pressure sensor. The ECM determines that the voltage signal from the crankcase pressure sensor is less than 0.2 VDC for more than 1 second. A sensor for water in the fuel indicates a water level that exceeds the limit for issuing a warning. 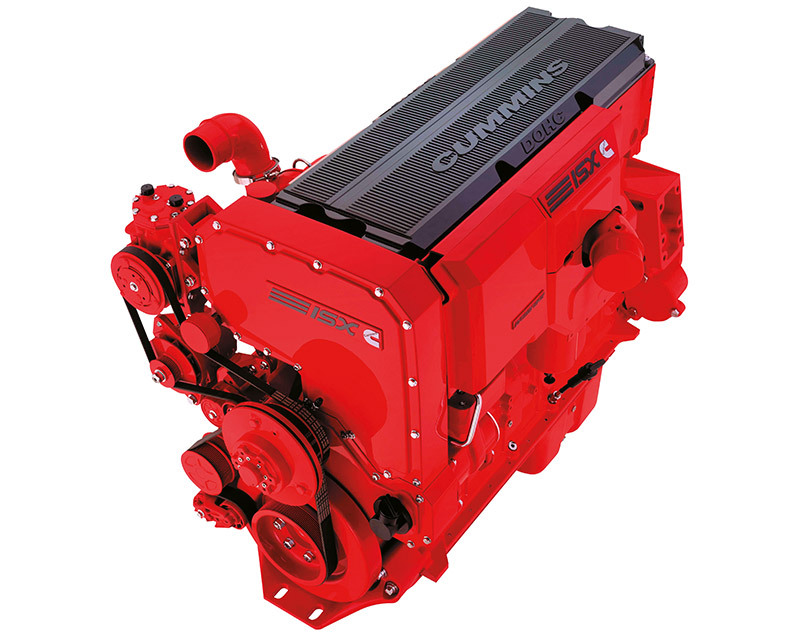 The ECM detects the presence of water in the fuel for a long time. The differential pressure sensor circuit on the exhaust gas recirculation valve is a chaotic character or incorrect data. An error was detected between the exhaust gas recirculation system differential pressure sensor signal or the sensor did not pass the auto-zero test. A high signal voltage or an open circuit was detected in the temperature sensor circuit of the particulate filter of the exhaust gas cleaning system. The ECM determines that the signal from the temperature sensor output signal of the particulate filter exceeds 4.97 V dc for more than 2 seconds. A low signal voltage has been detected in the temperature sensor circuit of the particulate filter exhaust system. The ECM determines that the signal from the temperature sensor output signal of the particulate filter is less than 0.1 V DC for more than 2 seconds. The signal from the temperature sensor at the output of the particulate filter does not change with changing engine operating conditions. The temperature in the exhaust gas cleaning system is the chaotic nature or incorrectness of the data. A high signal voltage was detected in the differential pressure sensor circuit of the exhaust gas cleaning system. The ECM determines that the signal voltage of the differential pressure sensor on the particulate filter exceeds 4.75 VDC for more than 1 second. A low signal voltage or an open circuit was detected in the differential pressure sensor circuit on the particulate filter of the exhaust gas cleaning system. The ECM determines that the signal voltage of the differential pressure sensor on the particulate filter is less than 0.25 VDC for more than 1 second. The differential pressure sensor on the filter of solid particles of the exhaust gas cleaning system is a chaotic character or incorrect data. The chaotic nature of the signal of the differential pressure sensor on the filter of solid particles of the exhaust gas cleaning system. Exhaust Gas Recirculation Controller – Incorrect Calibration. The procedure for automatically calibrating the exhaust gas recirculation valve is not completed. The sensor circuit content of nitrogen oxides at the outlet of the exhaust gas cleaning system – voltage below normal or short circuit to low voltage circuit. An internal malfunction has been detected in the nitrogen oxides content sensor at the outlet of the exhaust gas cleaning system. The drive controller changes the geometry of the turbocharger – incorrect calibration. The ECM module predelil , that the automatic calibration of the turbocharger with variable geometry is not performed at the first turn of the start switch to the ON position. The differential pressure sensor in the exhaust gas recirculation system detected a low gas consumption in the exhaust gas recirculation system, or the readings of the differential pressure sensor do not correspond to the engine operating conditions. The pressure drop across the exhaust gas recirculation valve is accurate, but above normal, the average severity level. The circuit of the pressure sensor in the common high pressure fuel line, but exceeding the norm. The ECM detects that the pressure in the common high pressure fuel line is higher than the specified one. The amount of soot in the particulate filter of an exhaust gas cleaning system exceeds the recommended limits. The ECM determines that the amount of soot in the particulate filter of an exhaust gas cleaning system is above normal (average severity level). To remove soot, regeneration of the exhaust gas cleaning system is necessary. The ECM determines that the amount of soot in the particulate filter of the exhaust gas cleaning system exceeds the maximum allowable limit. The drive control of the change in the geometry of the turbocharger has detected a low battery voltage. The power supply voltage of the electronic control module is accurate, but exceeds the norm – the average level of severity. The ECM detects that the signal from the crankcase pressure sensor does not change when the engine conditions change. The ECM determines that the temperature sensor signal is chaotic. Engine torque is reduced due to the vehicle operating at high altitude. The ECM determines that the ambient pressure is below a calibrated value. A high internal drive temperature has been detected, changing the geometry of the turbocharger. This DTC is recorded when the internal temperature of the drive changes the geometry of the turbocharger to exceed 125 ° C continuously for 30 minutes. The temperature of the exhaust gases entering the exhaust gas cleaning system exceeds the engine protection limit. The ECM determines whether there is an elevated temperature in the exhaust gas cleaning system, provided that there is no active regeneration of the particulate filter of the exhaust gas cleaning system. The temperature sensor No. 2 reading at the inlet of the particulate filter exceeded the maximum temperature limit. The temperature sensor No. 2 reading at the inlet of the particulate filter exceeds 649 ° C for 5 seconds and then drops to below 550 ° C.
The readings of the temperature sensor No. 2 at the inlet of the particulate filter exceeded the maximum limit of the engine protection system in terms of temperature. The readings of the temperature sensor No. 2 at the inlet of the particulate filter are critical. The temperature sensor No. 3 readings at the inlet of the particulate filter exceeded the maximum temperature limit. The sensor reading on the output of the particulate filter exceeds 649 ° C for 5 seconds and then drops to below 575 ° C.
The readings of the temperature sensor No. 3 at the inlet of the particulate filter exceeded the maximum limit of the engine protection system in terms of temperature. The readings of the temperature sensor No. 3 at the inlet of the particulate filter are critical. Crankcase ventilation filter requires maintenance. The ECM module determined that the pressure of crankcase gases exceeds the calibrated level. The pressure drop across the particulate filter exceeded the maximum operating limit, or the particulate filter is clogged. The ECM determines that the particulate filter of the exhaust gas cleaning system is clogged, or that the pressure drop across the particulate filter exceeds the maximum limit. The particulate filter of the exhaust gas cleaning system is missing. An open circuit or high voltage is detected in the signal circuit of the motor brake solenoid valve. A pulse width modulated signal with a level greater than the required signal is detected in the motor brake circuit when this signal is turned off by the ECM. A low voltage is detected in the signal circuit of the motor brake solenoid valve. A signal with a pulse width modulation with a level equal to the system supply voltage when this signal is turned on is not detected in the motor brake circuit. A high voltage has been detected in the power supply circuit (5 V) of the accelerator position sensor. A low voltage has been detected in the power supply circuit (+5 ) In the accelerator pedal position sensor. Discovered the opening of the vehicle emergency exit door. A DTC registers when the vehicle’s emergency exit door is open. The variable geometry turbocharger controller does not correctly recognize the J1939 standard messages received from the multiplex network from the ECM. The ECM does not receive a valid message on the J1939 multiplex network from the ECM for more than 1 second. A high voltage or an open circuit is detected in the signal circuit of the boost pump. A pulse width modulated signal with a level greater than 0 V is detected in the booster fuel pump circuit when this signal is turned off by the ECM. A low signal voltage has been detected in the booster pump circuit. A pulse width modulated signal with a level of 0 V was detected in the boost fuel pump circuit when this signal was turned on by the ECM and should be equal to the system supply voltage. Exhaust Gas Recirculation Valve Position Sensor Circuit – Voltage Above Normal or Short Circuit to High Voltage Circuit. The ECM determines that the EGR valve position sensor voltage is greater than the value specified in the calibration. A low signal voltage has been detected on the EGR valve position sensor circuit. The ECM determines that all position sensors show a high signal (or all position sensors show a low signal). A high signal voltage has been detected in the differential pressure sensor circuit of the exhaust gas recirculation system. The ECM detects that the differential pressure sensor signal on the exhaust gas recirculation valve exceeds 4.8 VDC for more than 4 seconds. A low signal voltage has been detected in the differential pressure sensor circuit of the exhaust gas recirculation system. The ECM detects that the differential pressure sensor signal on the exhaust gas recirculation valve is less than 0.26 VDC for more than 2 seconds. The ECM has detected a high turbocharger speed. The ECM determines that the turbocharger speed exceeds the maximum limit specified in the calibration. The resistance of the actuator valve of the fuel system is too high or too low. The malfunction code is registered in the presence of disappearing failures of a chain of the executive valve of the fuel pump. Periodic disruption of the crankshaft speed sensor. The ECM detects the presence of a fading or attenuated crankshaft speed / position sensor signal after some time has elapsed. Periodic disruption of the camshaft speed sensor. The ECM detects a disappearing disappearance of the speed / camshaft position sensor signal. The turbocharger speed sensor shows an error when determining the speed. The ECM has determined that the rotational speed of the turbocharger is increasing faster than is physically achievable for the turbocharger. The temperature at the turbine inlet to the turbocharger exceeded the limit of the inclusion of engine protection. The ECM determines that the calculated inlet temperature of the turbine exceeds the value specified in the calibration. The ECM determines that the calculated temperature at the outlet of the turbocharger compressor exceeds 238 ° C.
The ECM has detected a broken terminal or motor winding. The module (ECM) has detected an open circuit in the engine wiring harness or in the motor winding of the exhaust gas recirculation valve. The ECM has detected a short circuit at the terminals or motor winding to ground or power. The ECM detects a short circuit in the exhaust gas recirculation valve motor circuits. Exhaust gas recirculation control circuit – voltage is higher than normal or short circuit to high voltage circuit. The ECM determines that a high voltage is detected in the exhaust gas recirculation valve motor circuit. The cycle time of the electric motor valve exhaust gas recirculation system is exceeded, indicating that the valve is stuck in the open position. This DTC is recorded when the duty cycle required to open the exhaust gas recirculation valve exceeds 95% for 3 seconds. The exhaust gas recirculation valve controller will attempt to re-open the valve after 10 seconds. The malfunction code is registered after three unsuccessful attempts. The differential pressure sensor in the exhaust gas recirculation system detected a high gas flow rate in the exhaust gas recirculation system, or the readings of the differential pressure sensor do not correspond to the engine operating conditions. The pressure drop in the exhaust gas recirculation system exceeds the value specified in the calibration. A pulse width modulated signal with a level equal to the system supply voltage is detected in the motor brake circuit when this signal is turned off. A low signal voltage has been detected in the motor brake control circuit. The ECM detects that the motor brake control circuit has a short to voltage on the low voltage circuit. Motor brake drive circuit – voltage is above normal or short circuit to high voltage circuit. The ECM detects that the motor brake control circuit has a short to voltage on the high voltage circuit. The pressure sensor circuit in the exhaust system – the voltage is above normal or short circuit to the high voltage circuit. The ECM detects that the pressure sensor signal in the exhaust system is greater than 4.75 V DC for more than 4 seconds. The pressure sensor circuit in the exhaust system – the voltage is below normal or short circuit to the low voltage circuit. The ECM determines that the voltage signal from the pressure sensor in the exhaust system is less than 0.25 VDC for more than 4 seconds. The temperature sensor circuit in the exhaust gas recirculation system – voltage above normal or short circuit to high voltage circuit. The ECM determines that the signal from the temperature sensor in the exhaust gas recirculation system exceeds 5.1 VDC for more than 1 second. The temperature sensor circuit in the exhaust gas recirculation system – voltage below normal or short circuit on the low voltage circuit. The ECM determines that the signal from the temperature sensor in the exhaust gas recirculation system is less than 0.09 V dc for more than 1 second. Fan control circuit – Voltage above normal or short to high voltage circuit. The ECM detects a pulse width modulated signal with a level greater than 0 V in the fan control circuit when this signal is turned off by the ECM. The logic controller for changing the geometry of the turbocharger has detected abnormal extreme positions, or the drive for changing the geometry of the turbocharger cannot go to the closed position. The fault code is set when the actual position of the drive changes the geometry of the turbocharger does not match the specified for more than 10 seconds. Ambient temperature – chaotic nature or incorrect data. The ECM module has detected the chaotic nature of the signal from the ambient temperature sensor. Cylinder 1 injector solenoid valve relay – Incorrect calibration. Incorrect information entered from barcode nozzles. The ECM determines that the cylinder 1 nozzle barcode value was entered into the ECM incorrectly. Cylinder 2 Injector Solenoid Relay – Incorrect Calibration. Incorrect information entered from barcode nozzles. The ECM determines that the cylinder 2 nozzle barcode value was entered into the ECM incorrectly. Cylinder 3 injector solenoid valve relay – Incorrect calibration. Incorrect information entered from barcode nozzles. The ECM determines that the cylinder 3 injector barcode value was entered into the ECM incorrectly. Cylinder 4 injector solenoid valve relay – Incorrect calibration. Incorrect information entered from barcode nozzles. The ECM determines that the nozzle 4 barcode value was entered into the ECM incorrectly. The ECM determines that the coolant level is below the limit for normal operating conditions. The position of the actuator during initial power-up is not determined by internal means due to the mechanism jams or internal faults. The actual position of the drive changes the geometry of the turbocharger unknown. The chaotic nature of the signal of the pressure sensor in the exhaust system at the first turn of the start switch to the ON position. The ECM has determined that the pressure in the exhaust system is higher or lower than that of other absolute sensors in the engine after setting the start switch to the ON position when the engine is not working. 2. The ECM determines that the pressure in the exhaust system during normal engine operation is less than the value specified in the calibration. A high signal voltage is detected in the intake heater circuit. A pulse width modulated signal with a level greater than 0 V is detected in the fan control circuit when this signal is turned off by the ECM. A low signal voltage is detected in the intake heater circuit. No pulse width modulated signal with a level equal to the system supply voltage was detected in the intake system heater circuit when this signal was turned on. Auxiliary signal circuit with pulse width modulation – voltage above normal or short circuit to high voltage circuit. A high voltage signal has been detected on the analog torque circuit. Auxiliary signal circuit with pulse width modulation – voltage below normal or short circuit to low voltage circuit. A low signal voltage is detected in the analog torque signal circuit. A variable geometry turbocharger logic controller detected an internal error. The drive changes the geometry of the turbocharger has detected an internal error in the logic controller of the turbocharger. A mismatch in the drive calibration of the turbocharger geometry change and the ECM was found. The ECM module has detected an incompatibility in drive calibration for changing the geometry of the turbocharger and the ECM. 2. The drive changes the geometry of the turbocharger found that the supply voltage does not match the installed drive, taking into account the catalog number. 3. The ECM module determined that the turbocharger does not have an appropriate drive for changing the geometry. The drive circuit changes the geometry of the turbocharger – the rate of updating data is not correct. The main engine ECM does not receive a reliable message over the multiplex network J1939 from the drive changing the turbocharger geometry for more than 1 second. A soot blockage has been detected on the front end surface of the catalytic converter. The ECM determines the presence of conditions for clogging the end face of the catalytic converter and the possibility of clogging. The ECM determines that the amount of soot in the particulate filter of the exhaust gas cleaning system is above the norm (lowest level of severity). To remove soot, regeneration of the exhaust gas cleaning system is necessary. The exhaust gas recirculation valve is closed to lower the temperature of the coolant. Coolant temperature – the state is maintained. It has been found that active regeneration of the particulate filter of the exhaust gas cleaning system will be ineffective. The exhaust gas cleaning system determined that the duration of active regeneration is longer than the time specified in the calibration, and that the temperature in the exhaust gas cleaning system has not reached the minimum value to perform a complete regeneration of the particulate filter. The temperatures in the exhaust gas cleaning system do not reach the values ​​required for regeneration in stationary conditions. The ECM module determines that the measured inlet temperature of the catalytic converter does not correspond to the level required for regeneration in stationary conditions. 2. The ECM module determines that the temperature of the exhaust gases entering the exhaust gas cleaning system is not high enough to remove water from the system when the engine is at idle for a long time. An increased amount of black smoke from the engine into the particulate filter of the exhaust gas cleaning system has been detected. This DTC is recorded when the accumulation of soot inside the particulate filter is faster than under normal conditions. Barcode group nozzles – incorrect calibration. Incorrect information entered from barcode nozzles. The ECM determines that nozzle barcode values ​​are entered into the ECM incorrectly. Nitrogen oxide sensor at the outlet of the exhaust gas cleaning system – The rate of data update does not correspond to the norm. The data communication between the ECM module and the sensor of nitrogen oxides in exhaust gases through the communication channel SAE J1939. The sensor of nitrogen oxides at the outlet of the exhaust gas cleaning system is accurate, but above the norm is the lowest level of severity. The magnitude of the signal of the sensor content of nitrogen oxides exceeds the recommended level. This DTC is recorded when the diagnostic procedure determines that the output of the nitrogen oxide sensor is greater than the value specified in the calibration for two consecutive ignition cycles. The content of nitrogen oxides at the outlet of the exhaust gas cleaning system is accurate, but above the norm is the highest level of severity. The magnitude of the signal of the sensor content of nitrogen oxides exceeds the recommended level. Particulate filter regeneration is disabled because the regeneration inhibit switch is set to inhibited. This DTC is registered when the regeneration inhibit switch is set to inhibited and DTC 1921, 1922 or 2639 goes active due to the large amount of soot in the particulate filter. Engine oil replacement is required due to its possible dilution with fuel. This DTC is recorded when the ECM detects that the engine oil will liquefy the fuel. The exhaust gas recovery system valve is closed during the regeneration of the particulate filter of the exhaust gas cleaning system. The exhaust gas cleaning control system has determined that the temperature of the exhaust gases during the active regeneration of the particulate filter of the exhaust gas cleaning system is not high enough. The temperature in the exhaust gas recirculation system is accurate, but above normal, the lowest level of severity. The temperature in the exhaust gas recirculation system has exceeded the activation limit of engine protection. The ECM detects that the temperature in the exhaust gas recirculation system exceeds the temperature specified in the calibration system for more than 5 seconds. The temperature in the exhaust gas recirculation system is accurate, but above normal, the average level of severity. The temperature in the exhaust gas recirculation system has exceeded the activation limit of engine protection. The ECM determines that the temperature in the exhaust gas recirculation system exceeds 246 ° C for more than 5 seconds. Coolant temperature – data is accurate, but above normal – the lowest level of severity. Coolant temperature exceeds the warning limit of the engine protection system. The ECM determines that the signal voltage from the coolant temperature sensor exceeds the calibrated limit set in the ECM. Temperature in the intake manifold – these are accurate, but exceed the norm – the lowest level of severity. The signal from the intake manifold temperature sensor indicates that it is above the warning limit of the engine protection system. The ECM determines that the voltage signal of the temperature sensor in the intake manifold exceeds the calibrated limit set in the ECM. The ECM detects that the signal from the intake manifold pressure sensor is not correct for these engine conditions. The ECM determines that the pressure sensor signal in the intake manifold does not change when the engine conditions change or is chaotic when the start switch is turned to the ON position. Liquid dosing unit temperature for diesel engine exhaust systems – Chaotic nature or incorrect data. An internal error has been detected in the dosing unit for diesel engine exhaust systems. The ECM determines that the sensor signal for the internal temperature of the liquid metering unit for diesel engine exhaust systems is inconsistent with signals from other temperature sensors installed on the engine for two consecutive ignition cycles during diagnostics. A high signal voltage is detected in the temperature sensor circuit at the input to the catalytic converter. The ECM detects that the voltage at the input of the catalytic converter is higher than 4.4 VDC for more than 2 seconds. A low signal voltage is detected in the temperature sensor circuit. The ECM determines that the voltage at the input of the catalytic converter is at least 0.13 V DC for more than 2 seconds. The signal of the temperature sensor at the inlet to the catalytic converter does not change when the engine operating conditions change. The ECM determines that the signal from the temperature sensor at the input of the catalytic converter is invalid (contrary to common sense) for more than 5 minutes. Catalytic Inlet Temperature Sensor – The rate of change is not normal. The temperature sensor at the inlet of the catalytic converter does not respond to changes in engine operating conditions. The ECM determines that the temperature at the inlet of the catalytic converter does not change as the engine conditions change. The temperature sensor circuit on the release of the catalytic converter SCR – voltage above normal or short circuit to high voltage circuit. The ECM detects that the voltage signal from the temperature sensor at the output of the catalytic converter exceeds the value specified in the calibration when the start switch is in the ON position. Catalytic Output Temperature Sensor Circuit – Voltage below normal or short to low voltage circuit. The ECM detects that the voltage signal of the temperature sensor at the output of the catalytic converter is less than the value specified in the calibration when the start switch is in the ON position. The temperature sensor at the outlet of the catalytic converter does not respond to changes in engine operating conditions. The ECM determines that the temperature at the outlet of the catalytic converter does not change as the engine conditions change. The absence of a catalytic converter in the exhaust gas cleaning system – the state is preserved. The ECM determines that there is no selective catalytic converter in the exhaust system. Incorrect catalytic converter inlet temperature sensor connection – Incorrect calibration. The connectors of the temperature sensors at the inlet and at the outlet of the catalytic converter are interchanged. The ECM determines that the temperature sensor signals at the input and at the output of the catalytic converter are interchanged. A high inlet temperature for the catalytic converter has been detected. The ECM determines that the inlet temperature of the catalytic converter exceeds the value specified in the calibration. A high temperature has been detected at the outlet of the catalytic converter. The ECM determines that the temperature at the outlet of the catalytic converter exceeds the value specified in the calibration. A high voltage signal has been detected in the circuit of a fluid line heater for diesel engine exhaust systems. The fluid injection controller in the exhaust gas cleaning system of diesel engines determines that the voltage on the line heater exceeds the value specified in the calibration. A low signal voltage has been detected in the heater line heater relay circuit for an exhaust gas cleaning system. The ECM determines that the voltage on the line heater exceeds the value specified in the calibration. A high voltage signal was detected in the heater circuit 2 of the fluid line for the exhaust systems of diesel engines. The ECM determines that the voltage on the line heater is lower than the value specified in the calibration. Exhaust Gas Heater – Mechanical System Reaction Is Not Correct Or The Adjustment Is Disrupted. The ECM issued a command to turn on the fluid heater in the tank of the exhaust gas cleaning system, but the temperature sensor in the tank did not detect its increase. The circuit of the fluid line heater for the exhaust gas cleaning system is a current below normal or an open circuit. The fluid injection controller for the exhaust gas cleaning system detects an open circuit or a short to ground in the main line heater circuit. The circuit of the heater 2 fluid lines for exhaust systems of diesel engines – the current is below normal or open circuit. The fluid injection controller for diesel engine exhaust systems detects an open circuit or a short to ground in the main line heater circuit. The ECM does not receive the expected data in a timely manner from the accelerator position sensor connected to the multiplex network, or does not receive them at all. Exhaust gas recirculation – data is accurate, but below normal – the average level of severity. The ECM determines that the actual consumption in the exhaust gas recirculation system is lower than the target, based on current engine operating conditions. Exhaust gas recirculation – the data is accurate, but above normal – the average level of severity. The ECM determines that the actual consumption in the exhaust gas recirculation system is higher than the target, based on current engine operating conditions. The circuit of the heater 3 fluid in the exhaust gas cleaning system of diesel engines – the voltage is above normal or short circuit to the high voltage circuit. The fluid controller in the exhaust gas cleaning system of diesel engines determines that the voltage on the main line heater exceeds the value specified in the calibration. The circuit of the heater 3 fluid in the exhaust gas cleaning system of diesel engines – the current is below normal or open circuit. The circuit of the heater 4 fluid in the exhaust gas cleaning system of diesel engines – the voltage is above normal or short circuit on the high voltage circuit. The fluid injection controller in the exhaust gas cleaning system of diesel engines determines that the heater voltage exceeds the value specified in the calibration. The circuit of the heater 4 fluid in the exhaust gas cleaning system of diesel engines – the current is below normal or open circuit. The fluid injection controller for diesel engine exhaust systems detects an open circuit in the heater circuit. A real-time clock indicates that the engine is off. The engine off timer is not working properly, and its readings do not match those of other timers in the ECM. The throttle actuator position sensor circuit at the inlet – voltage above normal or short circuit to high voltage circuit. The ECM determines that the throttle actuator position sensor voltage is greater than the value specified in the calibration. Throttle Actuator Position Sensor Circuit at Intake – Voltage below normal or short to low voltage circuit. The ECM determines that the throttle actuator position sensor voltage at the intake is less than the value specified in the calibration. The throttle actuator position sensor at the inlet generates a chaotic signal, or the position of the throttle actuator at the inlet does not change when the engine operating conditions change. The ECM determines that the throttle actuator intake position sensor generates a chaotic signal, or the position of the intake throttle actuator does not change when the engine conditions change. The ECM determines that the dosing unit fails to fill the system. The controller of the injection of fluid in the exhaust gas cleaning system of diesel engines – the chaotic nature or irregularity of the data. The fluid injection controller in the exhaust gas cleaning system of diesel engines has detected a too high or too low voltage in one of the circuits of the dosing unit. Liquid dosing unit for exhaust systems of diesel engines – the voltage is above normal or short circuit on the high voltage circuit. The ECM detects that there is a short to a high or low voltage circuit or there is an open circuit on the exhaust gas metering valve circuit. Liquid dosing unit for exhaust systems of diesel engines – voltage below normal or short circuit to low voltage circuit. The ECM detects that the voltage of the signal or the power supply of the dosing unit for exhaust gas cleaning is outside the acceptable range (below normal). Liquid dosing unit for exhaust systems of diesel engines – the current is below the norm or open circuit. The ECM has detected an open circuit in the liquid dispensing unit for diesel engine exhaust systems. Liquid line heater relay for diesel engine exhaust systems – voltage is higher than normal or short circuit to high voltage circuit. The fluid injection controller for diesel engine exhaust systems detects that the voltage in the relay circuit of the fluid line heater for diesel engine exhaust systems exceeds the value specified in the calibration. Liquid line heater relay for exhaust systems of diesel engines – voltage below normal or short circuit to low voltage circuit. The fluid injection controller for diesel engine exhaust systems detects that the voltage in the heater line heater relay circuit for diesel engine exhaust systems is less than the value specified in the calibration. The circuit of the heater relay fluid in the exhaust gas treatment system of diesel engines – Current below normal or open circuit. An open circuit breaker fluid heater in the exhaust gas cleaning system of diesel engines. The fluid injection controller for diesel engine exhaust systems detects an open circuit in the heater line heater relay circuit for diesel engine exhaust systems. Fluid metering valve for exhaust gas cleaning system – voltage above normal or short circuit to high voltage circuit. The fluid injection controller for the exhaust gas cleaning system detects that the voltage on the metering valve of the exhaust gas cleaning system exceeds the value specified in the calibration. Exhaust Gas Cleaning Dosing Valve – Voltage below normal or short to low voltage circuit. The fluid injection controller for the exhaust gas cleaning system detects that the voltage on the metering valve of the exhaust gas cleaning system is less than the value specified in the calibration. An internal error has been detected in the circuit for dispensing an exhaust gas cleaning fluid. A mechanical failure of the liquid metering valve for exhaust gas cleaning systems has been detected. The ECM determines that the exhaust pressure fluid pressure exceeds a threshold. Inlet lines of the dosing unit for diesel exhaust systems – the reaction of the mechanical system does not correspond to the norm or the adjustment is broken. The fluid injection controller in the exhaust gas cleaning system of diesel engines detected mechanical failure of the inlet piping of the dosing unit, and the liquid for the exhaust systems of diesel engines is not supplied to the dosing valve. A high signal voltage is detected in the circuit of the fluid pressure sensor for exhaust gas cleaning. The ECM detects that the signal voltage of the fluid pressure sensor for exhaust gas cleaning is out of range (above normal). A low signal voltage is detected in the circuit of the fluid pressure sensor for exhaust gas cleaning. The ECM detects that the signal voltage of the fluid pressure sensor for exhaust gas cleaning is outside the acceptable range (below normal). A low fluid pressure was detected in the dosing unit. The ECM determines that the pressure of the exhaust gas is below the threshold. The exhaust gas dosing unit detected an obstruction in the return line of the exhaust gas. Valve drain the fluid in the exhaust gas cleaning system of diesel engines – voltage above normal or short circuit to high voltage circuit. The ECM detects that the voltage at the drain valve for exhaust gas cleaning is outside the allowable range (above normal), or there is an open circuit. A low signal voltage has been detected in the drain valve circuit for diesel engine exhaust systems. The ECM detects that the voltage at the drain valve for exhaust gas cleaning is outside the acceptable range (below normal). Liquid drain valve for exhaust systems of diesel engines – the current is below normal or open circuit. The fluid injection controller for diesel exhaust systems detects an open circuit in the drain valve circuit for diesel exhaust systems. The fluid pressure sensor in the exhaust system of diesel engines detected a value that is too low or too high for operating conditions. The liquid dosing unit for diesel engine exhaust systems cannot maintain the specified fluid pressure for diesel engine exhaust systems. Fluid injection controller for exhaust gas cleaning system – Data update rate is inconsistent. The ECM determines that communication over the communication channel between the ECM and the fluid injection controller for the exhaust gas cleaning system is interrupted. Fluid injection controller for diesel engine exhaust systems – incorrect data was obtained from the network. The ECM determines that the data transmitted by the ECM to the fluid injection controller for diesel engine exhaust systems is not readable or missing. Liquid dosing unit for exhaust systems of diesel engines – the reaction of the mechanical system does not correspond to the norm or the adjustment is broken. The exhaust gas cleaning system with a selective catalytic converter detects an incomplete cycle when the power is turned off. The fluid injection controller for diesel exhaust systems detects an incomplete purge cycle when the power is turned off. The position of the nozzle turbocharger with variable geometry – the reaction of the mechanical system does not meet the norm or the adjustment is broken. The ECM has determined that the drive changes the geometry of the turbocharger is in the wrong position when setting the start switch to the ON position. Exhaust gas cleaning fluid injection controller temperature – these are accurate, but above normal – average severity level. The ECM has determined that the internal temperature of the fluid injection controller for exhaust gas cleaning exceeds the warning limit. The temperature of the liquid in the tank of the exhaust gas cleaning system of diesel engines is accurate, but below normal, the average level of severity. The ECM determines that the temperature of the fluid in the tank of the exhaust system of diesel engines cannot reach the set level. Exhaust gas dosing unit – the original cause is unknown. Failed to initialize the exhaust gas dosing unit. The dosing unit and the fluid injection controller for diesel engine exhaust systems cannot perform the initial data exchange between themselves at the first turn of the start switch to the ON position. and cannot perform initialization. A nitrogen oxide sensor has detected a fault in the sensor’s power supply circuit. The ECM determines that the supply voltage of the sensor for nitrogen oxides is above or below the threshold determined by calibration. ECM internal error due to software malfunction. The ECM detected a software or calibration error. Liquid line heater relay for diesel engine exhaust systems – the reaction of the mechanical system is not correct or the adjustment is broken. The ECM detects that a short circuit has been detected in the battery supply circuit of the fluid line heater for diesel exhaust systems. The sensor content of nitrogen oxides at the inlet of the exhaust gas cleaning system is accurate, but above normal, the average severity level. The ECM detects that the liquid metering unit for the exhaust gas cleaning system does not provide the prescribed metered liquid supply. Auxiliary Control Switch – Data update rate is not correct. The ECM does not receive a valid message on the J1939 multiplex network from the device connected to it for more than 1 second. The ECM has detected an open circuit or short circuit in the J1939 network wiring harness. An unexpected communication status has occurred in the communication channel between the ECM and the fluid controller in the exhaust gas cleaning system of diesel engines. The ECM has sent an unexpected message to the fluid injection controller for diesel engine exhaust systems that could not be recognized. Liquid supply for exhaust systems of diesel engines to the dosing unit is interrupted. The dosing unit determines that during the dosed supply of fluid for exhaust systems of diesel engines to the exhaust gas cleaning system the air supply is interrupted. The sensor signal content of nitrogen oxides at the outlet of the exhaust gas purification system remains constant as the engine operating conditions change. The ECM has determined that the sensor readings of nitrogen oxides do not change when the engine operating conditions change. The quality of the exhaust gas cleaning fluid is accurate, but below normal is the highest level of severity. The ECM has determined that the quality of the exhaust gas is below a critical threshold. The quality of the exhaust gas cleaning fluid is accurate, but below normal, the average level of severity. Fluid quality for exhaust gas cleaning – data refresh rate is inconsistent. The ECM has determined that the quality of the exhaust gas is a mechanical reaction that is not normal or the adjustment is broken. The exhaust gas cleaning quality sensor does not recognize the presence of liquid. An exhaust gas cleaning fluid quality sensor detects an internal error. The ECM has determined that the exhaust gas cleaning fluid quality sensor is defective. Exhaust gas quality sensor detects overheating. The ECM detects that the gas cleaning sensor has overheated. The quality of the exhaust gas cleaning fluid is accurate, but above normal. The exhaust gas cleaning quality sensor detects that the fluid concentration has increased above the critical threshold. Exhaust Fluid Drain Valve – Mechanical System Reaction is Missing or Adjusted. The ECM detects that the pressure of the exhaust gas does not drop when the start-up command is given to the exhaust gas cleaning valve. A high signal voltage is detected in the dosing system air pressure sensor circuit. Absolute air pressure sensor in the dosing system – voltage below normal or short circuit to low voltage circuit. A low signal voltage is detected in the air pressure sensor circuit in the dosing system. Temperature sensor in the fluid dosing system for cleaning exhaust gases – voltage is above normal or short circuit to high voltage circuit. A high signal voltage has been detected in the temperature sensor circuit in the liquid dispensing system for exhaust gas cleaning. The ECM detects that the voltage in the signal circuit of the temperature sensor in the liquid dispensing system for exhaust gas cleaning is outside the allowable range (above normal). Temperature sensor in the dosing system for exhaust gas cleaning – voltage below normal or short circuit to low voltage circuit. A low signal voltage is detected in the signal circuit of the temperature sensor in the fluid dispensing system for exhaust gas cleaning. The ECM detects that the voltage in the signal circuit of the temperature sensor in the liquid dispensing system for exhaust gas cleaning is outside the acceptable range (below normal). Exhaust Fluid Dosing System Air Valve — Voltage below normal or short to low voltage circuit. A low signal voltage is detected in the dosing system air circuit. The ECM detects that the dosing system’s air valve circuit has a short to voltage on the low voltage circuit. The air pressure in the exhaust gas cleaning dosing system is accurate, but below normal, the average severity level. A low air pressure was detected in the dosing unit. The ECM detects that the air pressure in the dosing system is out of range (below normal). The air pressure in the exhaust gas cleaning dosing system is accurate, but above normal, the average severity level. A high air pressure was detected in the dosing unit. The ECM detects that the air pressure in the dosing system is out of range (higher than normal). Exhaust Fluid Dosing Unit Air Valve — Mechanical System Reaction Is Not Allowed, or Adjustment is Disrupted. High air pressure was detected in the dosing unit when charging the system, when a close signal was given to the dosing unit air valve.